With UK stocks and the pound recovering from the Brexit-related chaos of the past week, it appears traders are still unwilling to accept the fact that, in trying to ram her extremely unpopular draft agreement down the throats of intransigent Tory Brexiteers (not to mention the still-furious DUP), Theresa May is facing an impossible task. Even analysts at now-bearish Goldman Sachs were willing to base their 'base case' on the likelihood that a modified version of the draft agreement would eventually pass at the eleventh hour as "it is characteristic of European negotiations to come down to the wire." But in a note published two days after May secured her cabinet's reluctant backing of the draft deal (setting off a furious confrontation with Brexiteers and other slightly more moderate pro-Leave Tories wary of becoming a "vassal state" of the EU), analysts at Deutsche Bank took what appears to be a more sober look at the steep odds facing a Brexit deal. Unlike Goldman, DB dares to assign odds to the possible outcomes: and it sees the probability that Theresa May will survive a leadership challenge and successfully pass the deal in hand at a paltry 35%. Th only reasonable scenario in which May's deal could pass would if "significant market pressure" is brought to bear againsst the Tories. It's more likely that one of two alternatives will follow: Either May calls for a second referendum (the dreaded "People's vote", which she has repeatedly insisted won't happen. But before any of this can happen, May will almost certainly be faced with a leadership challenge as MPs continue to file 'no confidence' letters with the 1922 Committee. The stakes here for the UK couldn't be higher: While it's very possible that May survives the vote, her margin of support is narrower than many believe. And if May loses the support of more than 130 MPs, DB believes she will resign rather than facing a defeat, setting off a chaotic leadership conference. Out of the chaos, DB expects that a Brexiteer leader would likely take power after running on an explicit 'no deal' platform. Should a confidence vote be triggered, the threshold for Prime Minister May surviving is a simple majority, after which no confidence vote can be triggered for twelve months. In political terms, if she loses more than 130-140 MP votes (around 40%) survival will be more difficult and there is a strong chance the Prime Minister resigns. Should a confidence vote be triggered today, it will happen within twenty four hours. Should this outcome materialise, we view the implications for markets as very negative. Unlike 2016, we see a strong probability that a full Conservative leadership contest results, with an ultimate vote taken to the Conservative Party membership, likely including a hard Brexiteer. The winner of the contest is likely to run on a no deal platform. We anticipate that the EU27 will make a no deal outcome their base case and both sides step up no deal planning. Even if she survives the vote, the prime minister would still be in a serious bind. The past two days have demonstrate that there's little political will to pass the draft agreement in its current form. And senior EU officials, including Michel Barnier, have made it clear that no more changes will be accepted. So the only other options available to Prime Minister May would be a policy pivot towards a much softer form of Brexit (eg EEA membership plus a permanent customs union), which would be likely to gain Labour Party support in the Commons. However, it's unclear whether the EU would be willing to allow this. The only other alternative would be a second referendum, which May has said she's resolutely opposed to doing. To be sure, DB's base case, like Goldman's, is that May survives a leadership challenge and that a deal is forced through at the last minute. In the meantime, DB believes the focus for their clients should be on a) whether a motion of confidence is called and what the result will be b) whether market pressure will be sufficient to change the political calculus. Nomura has also mapped out the likelihood that the customs union backstop could be removed from the deal during the following four scenarios. 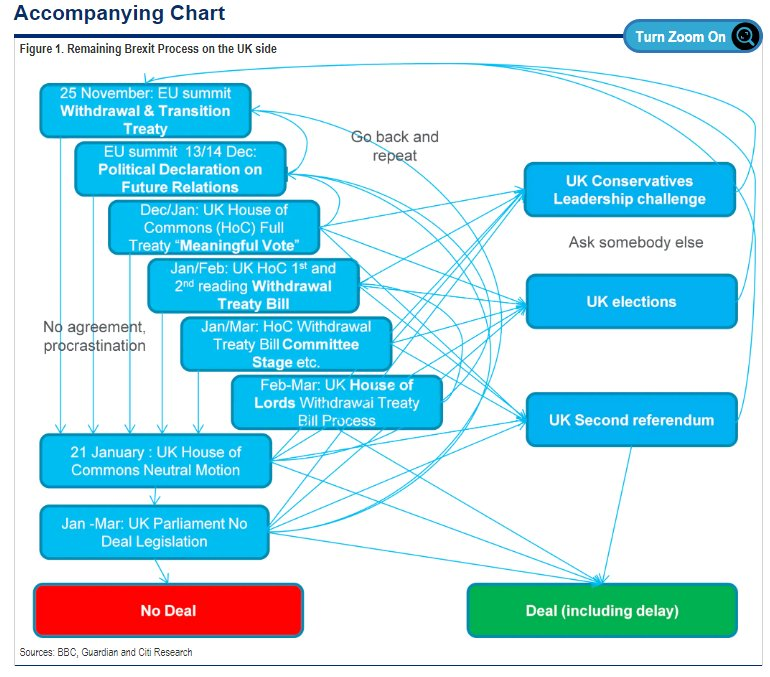 And if DB's worst case scenario (for markets) comes to pass, May is toppled, and a "no deal" Brexit becomes imminent, here's what that might mean for the pound. This would take the £ to parity.